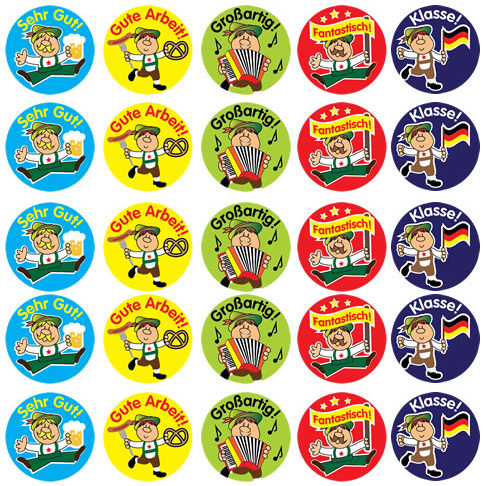 A range of German reward stickers with different messages of praise and encouragement written in German. This is a mixed pack of 125 stickers featuring designs as shown above*. Excellent. Just what I wanted. Easy to order, and arrived quickly. Nice but all very enthusiastic. A few 'good effort' level comments rather than all fantasic would be better. I as well as all who received these stickers were very pleased with them. 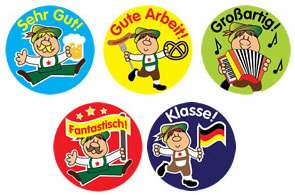 These were given in Christmas bags to all the school children at our German immersion school. There was much excitement about it actually being in German. We have no such resources available to us here in Alaska. The shipping time was amazingly fast as well.